A learned eye surveys the sky, disturbed by the result. here is Tullia’s Lamp? Where are her stars? Except for the arduous climb, Jmen Zemactzil’s pre-dawn duties on the threshold of the Day of the Cicada should have been routine—a quick prayer of supplication, just a few ritual actions, and an offering—release of a handful of the sacred insects. He had paused halfway up, not intending to look yet, just to catch his breath. His pounding heart reminded him: he was no squeaky-faced novitiate any more. He slumped on an ancient red sandstone step, let his lungs draw in the chill air. It carried a hint of the sea—a refreshing change from steaming earth and jungle, from the dung-speckled grazing lands and thirsty maize that scented the mist and fog on the coastal plain below. It was the call of the sea that made him look. Zemactzil’s eyes first retraced his steps, down the steep eastern face of the red Pyramid where half a million Returns ago Maya primitives shed blood to forgotten gods. At its base his gaze met the strip of white-sand beach where ocean and land had danced their tireless figures, back-and-forth, back-and-forth, since before eyes or ears existed to acknowledge them. Out across the face of the restless waters the Practitioner’s attention drifted, past the horizon that would swallow Nuncio Zelien’s ships this very day, and on—beyond the limits of mortal vision, where Creation might yet be shaping reality, then up toward the greatest of the wonders that this creation had ever wrought—the eyes of the Ancestors, the watching stars. So few in number they were. Much of the night sky still looked black. Still black? A queer notion. Of course the night sky is black. Regard the sky. It is you who chose its color. It was not a cloud. The black smudge did not move or change shape with the winds. The stars under its influence were not covered up, but they shone veiled and muted. 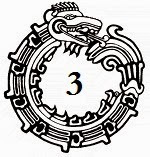 Many of the dimmer wayposts that traced the figure of Tullia were gone altogether—a terribly ill omen on this day when Chicxulub must launch Zelien’s brash ordained adventure, the City’s collective sin. Suddenly this was no routine ritual. Zemactzil knew the stars. He knew the moods of the sky as well as he knew his own. His long Returns of ascetic practice had not been idly spent. This was a nebula. It had come from beyond the stars and was moving with uncanny speed. He had seen no indication of it when he last consulted the stars on the Day of Gifts just eight days ago. Bewildered and aghast, he now sensed two red eyes in the midst of the darkness, with black vertical slits for pupils. And then the Voice spoke to him again, clear and rife with power. ‘Pray earnestly. Populate the Heavens until they glow warm’. These were your simple instructions, human. Why have you failed me? The Practitioner gasped, dropped to his knees, raised shaking arms in a desperate gesture of pleading. His heart was pounding through his skull. I repeat. What is wrong with the sky? The impatient voice bore into the Jmen’s soul, twining about his mind like an anaconda tightening its grip on a capybara. Zemactzil felt utterly inadequate, humiliated. He was half-way up the sacred pyramid, not yet worthy to offer his supplication. Though every bone in his body quavered like jelly, he stood and resumed his climb even as he grasped for a response. The word became all. He felt it, lived it. His blood ran thick with cold, and he shivered like a leaf. I do not enjoy repeating myself, human. Answer me. His prayers were fading into wordless desperation. He had not the strength to speak. He felt that if he could just reach the top of the pyramid he could properly obiesce toward this mysterious Spirit who was sending such dire omens. He pleaded for forgiveness for his order. It was a poorly concealed secret that many past Jmens had taken this duty lightly, had climbed a few steps up the east face of the pyramid, knelt toward the Guiding Stars of the North, spoken the ritual words, released the Cicadas from a pouch, and called it done. Now he was paying the price for their indolence. The spirit was waiting, like a school master tapping his foot before the desk of a recalcitrant student. That student was Zemactzil, and he had not completed his assignment. Still a hundred steps to the summit. His chest felt like it was collapsing inward. Pain speared up and down his left arm and shoulder, his breath came in little gasps. He was. Zemactzil collapsed in a heap, his eyes filled with tears, his chest wracked with tightness and unbearable pain. Dizziness was consuming his consciousness. I am infinite. I am your StrongMother. Can you humans be salvaged? Should I bother? The last phrase lingered on blue lips twitching with involuntary spasm. His eyes wide, frozen toward the black intruder consuming the northern constellation, Jmen Zemactzil spoke no more, and as he died the StrongMother’s presence utterly abandoned him. It is the way, Naja. A seed sown and nurtured. You urge patience, Kilkinney? When all around us the death-wind shrieks? No. I will not … ooooh!